Son of Evil Reindeer is a fitting follow-up to 2001's Y'all Get Scared Now, Ya Hear!, one of the year's best records, a lush pop treat of vocal harmonies, instrumentation, and hooks. 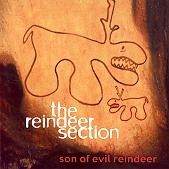 On Son of Evil Reindeer, Reindeer Section, featuring members of Belle & Sebastian, Mogwai, Arab Strap, and Snow Patrol, write another batch of captivating, stunning pop perfection. "Grand Parade" starts off quietly and builds to offer you string arrangements, laid back melodies, and tranquility in the form of a pop song, using vocal harmonies and sparkling piano to accompany the strings and ensure a beautifully composed near-masterpiece. "Strike Me Down" blends male/female vocals and a soft guitar with raindrop percussion, creating a late night, rainy day gem that uses space and air, not lush arrangements, to reel you in. The band shines with the 'less is more' aesthetic, proving they can get the same reaction out of you even when they're not layering it on. This is also the mindset for "Your Sweet Voice", a slumbering number that finds you completely relaxed as the music becomes the sweet air you're breathing in. Reindeer Section takes it one step further on "Where I Fall", relying only on an acoustic guitar and a voice to make you feel. And they pull it off. Then on "Last Song on Blue Tape" and "Cold Water" Reindeer Section allows the listener to hear their subtle, yet lush pop craft in full force. Defending pop music's honor and creating another record that will find its name on several end-of-year best of lists, the Reindeer Section's Son of Evil Reindeer is an album you will remember, an album that, once you hear, you won't be putting away any time soon. It is the epitome of what indie pop could, and should, be. I'll give it an A.
Regurgitator: Tu-Plang...Kon-Uauk Reindeer Section: Y'all Get Scared Now, Ya Hear!